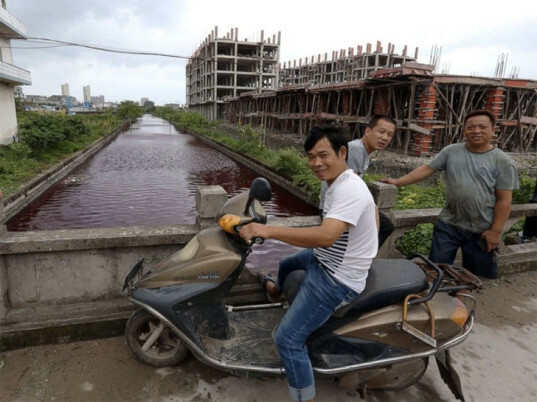 Residents of a city in eastern China are baffled after a river turned blood red, seemingly overnight. Locals from Wenzhou, a prefecture in the Zhejiang province, said the river looked normal at 5 a.m. Beijing time on Thursday but then turned a deep crimson within the hour. Residents also complained of a strange smell that wafted through the air. Inspectors from the Wenzhou Environmental Protection Bureau say haven’t found the cause of the incident, although industrial contamination has been ruled out because there are no chemical plants along the waterway. 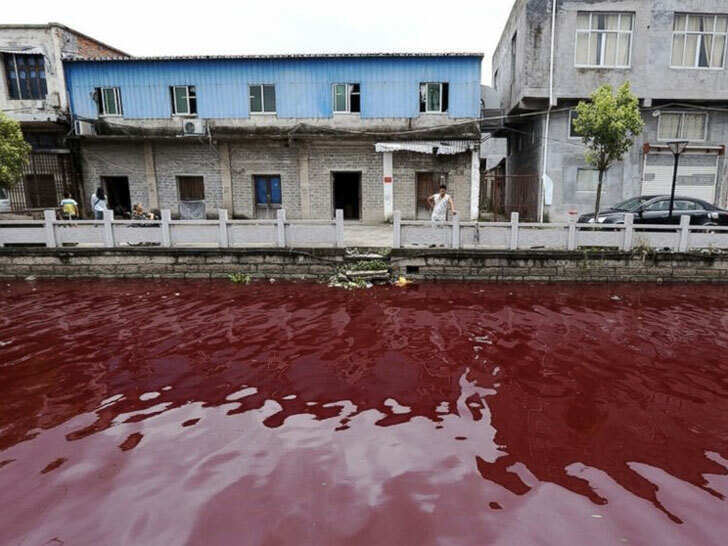 In December 2011, the Jian River in northern China turned scarlet after a nearby chemical factory, which was producing red dye for Chinese New Year fireworks wrappers, illegally dumped their runoff in the city’s storm-water pipes. This happens all the time and the media claims it's mystery, when it's dyes from manufacturing plants being dumped into the waterways. Even tho they say it isn't, it is. When it started to "rain blood" in Kerala, India, some of the people there too assumed the end of days. It turned out to be an algal bloom, and that it had been in the air for some time until rain collected it as it fell. Residents of a city in eastern China are baffled after a river turned blood red, seemingly overnight. Locals from Wenzhou, a prefecture in the Zhejiang province, said the river looked normal at 5 a.m. Beijing time on Thursday but then turned a deep crimson within the hour. Residents also complained of a strange smell that wafted through the air. Inspectors from the Wenzhou Environmental Protection Bureau say haven't found the cause of the incident, although industrial contamination has been ruled out because there are no chemical plants along the waterway.